A few years ago, I did a review of Via 313 in Austin, that featured “Detroit-style pizza” (which is actually a thing, as we’ll review below), but realized that I’ve never really reviewed a proper Detroit-style pizza place here in…. Detroit. The canonical source for Detroit-style “square” pizza is Buddy’s, but their original location is way up at McNichols (aka “6 Mile”) and Conant, and for my visit to Detroit I was actually downtown without a vehicle, so I decided to check out a place with my friend Brian (an actual Detroit resident!) 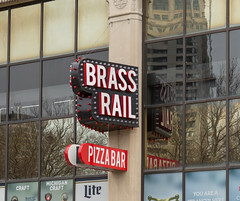 on Grand Circus Park, just across the street from the giant Hazen Pingree statue: the Brass Rail. The Brass Rail is mostly a sports bar catering to the various pre-game communities (it’s right by Comerica Park and Ford Field, and only a hop, skip, and a brisk jog from Little Caesers Arena), and has a rather huge indoor seating area (with Brian and I being on of a few customers on a non-game Monday evening). Interestingly, while Brass Rail’s opening in 2017 replaced an earlier restaurant called R.U.B. BBQ, apparently this isn’t the first Brass Rail at this approximate location, there used to be one of three “Brass Rail” bars in downtown all featuring elaborate woodwork and really long bars… but none of these survived the 70s. 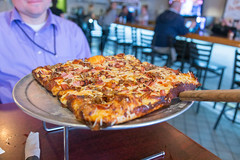 In any case, Brass Rail is essentially a sports bar selling pizza, and in a nod to modern pizza tastes, they sell two styles of pizza: standard American round pizza, and Detroit-style square pizza. While they had a very wide assortment of toppings, including some interesting combinations (I almost got the Chip of the Ole’ Block with cippolini onions, arugula, lemon zest, bacon, and balsamic reduction), I ended up going old school and getting the “Mighty Meaty”: mozzarella, provolone, house sweet italian sausage, pepperoni, ham, bacon. The key to Detroit-style pizza is that, somewhat like Chicago Deep Dish, it’s about the thick crust: a relatively thick and yeasty breaded crust that’s baked in oil to give it a good crisp. Since it’s important to keep this bread crust crispy without letting too much sauce seep into it, a Detroit-style pizza also has an unusual pizza topping stacking order, with at least one layer of cheese below the sauce (versus the normal practice of saucing the dough directly). The result is a pleasant variation on the standard pizza approach, and if one is liking a lot of crispy, well-oiled crust with toppings, a Detroit-style pizza does nicely. And Brass Rail’s Mighty Meaty is a particularly good example of the style: a rich and crispy crust that’s practically fried in the oil, cheese all the way to the edge (also crisping nicely), and a good selection of meat toppings and a pleasantly spicy and tangy sauce without too much salt: this was a good pizza. So yeah, if you are downtown in Detroit considering pizza, well, Brass Rail is a great dinner option. Manchester, NH is a funky little town. New Hampshire’s Queen City, it has a lot of character in some of its neighborhoods. Downtown is located in what used to be the mill district (indeed, most of the Millyard is still there, being converted into various offices, industrial lofts, and the like), and there are even a few ethnic neighborhoods. One of these is the West Side, where two of the larger neighborhoods (Notre Dame and Rimmon Heights) are actually Quebecois in heritage. The area had some tough years, with “urban renewal” between the 1960s and 1980s actually razing two decent neighborhoods and turning them into dismal strip malls, but the area has generally rebounded, diversified a bit, and, well, even gentrified a bit. But in addition to the notable large French Catholic Churches, the neighborhood still has a lot of Quebecois heritage, especially in the food scene. There’s probably no better place for this than Chez Vachon.